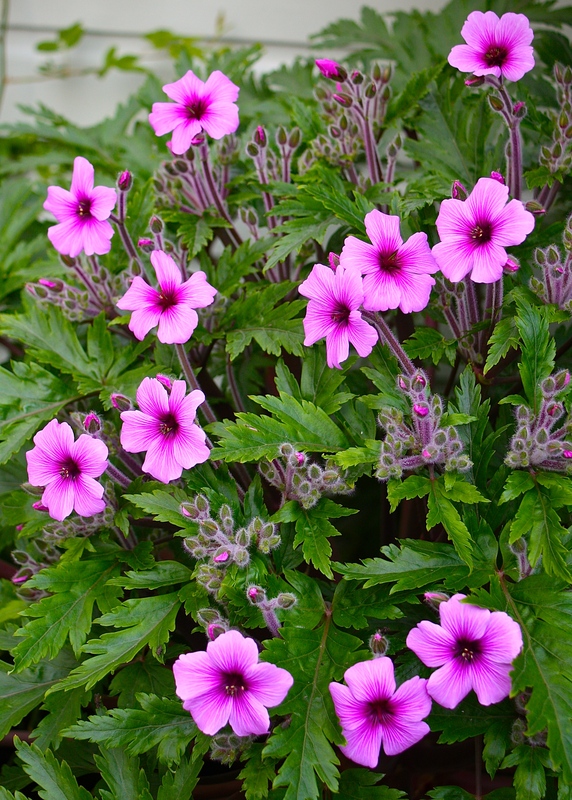 The last plant I expected to be blooming over the New Year was Geranium maderense, the Maderia Cranesbill. Clearly confused, a few shocking-pink flowers are braving the elements, sheltered below an umbrella of huge glossy leaves. The foliage is faring less well. Nestled in a gap by the front steps the leaves are in the way of booted feet, pushchairs and howling gales, so have been duly shredded. If the poor plant can survive the remainder of the winter we should enjoy a wonderful candy-coloured cloud of flowers come April. Having lost plants every winter for the last five years, it makes me wonder whether we should try again with these dazzling divas in other parts of the garden. Have grown this for many years in the midlands UK…love it’s huge impact. Wonderful plant, confused or not! It is, but heartbreaking when you see them frosted and looking like overdone cabbage. I am not sure I can take the heartbreak! Out of interest, do they grow for you at Cliffe? We haven’t had them for a while, think we lost them over the bad winters so no self seeding. We have many Geranium palmatum that seed everywhere but are second best in my opinion. The deer also adore them so get well munched on a regular basis. They are on the wish list! Well I have them coming up everywhere, and seed of the white variety. I will endeavour to pot some up in spring and get them to you. Although not as spectacular, G. palmatum is still nice – looks a bit like a Catherine wheel when it’s in full bloom. I have one that’s nearly eight years old and still going strong from the same, very long ‘trunk’.